What should I consider before choosing a pergola? Have you ever felt like something was missing from your Central Ohio garden or yard? A pergola is a structure that will transform your property into something even more beautiful. What will be the primary use of your pergola? It is important to think about how you will be using your pergola. Will it be used as a place for entertainment on the patio? Will it be in the garden to provide beauty and shade? 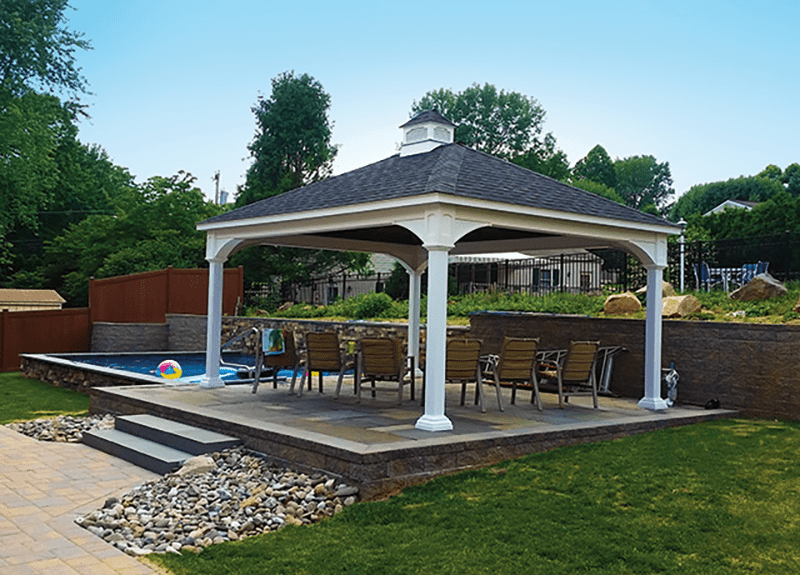 Before anything else, consider the usage and location of the pergola. What style and design do you want? The visual look of your pergola is vital because it enhances your yard and increases the value. Take your time selecting the shape, colors, and materials. For instance, do you want a wooden pergola or vinyl? Do you prefer a dark stain or a fresh white paint? Eastern Sky has a photo gallery of pergolas to aid with your design choice. What about roof and lighting? Depending on the main purpose of your pergola, you may need a certain kind of roof. There are different protection levels, such as vines, sails or steel and thatch. Vines, in particular, can be beautiful, and many varieties grow well in Central Ohio, such as Honeysuckle, Lilac and Clematis. Imagine an evening under your pergola, enjoying the fragrance of honeysuckle at dusk! Another thing to consider is if your pergola needs lighting. For use of the pergola at night, you will need to choose a lighting scheme. If you are not planning to use it at night, it is fine to leave it unlit. Do not forget about the laws and regulations in your town. Be sure to check with your local council or city hall for permits or restrictions involving pergolas. Eastern Sky designs and builds pergolas for the garden, patio, entryway, or anywhere in the yard. Contact us today to make this timeless addition to your property.